Part of our current economy is worker retraining. Learning new approaches, learning new skills, becoming more computer proficient are all part of what it takes to get employed and stay employed in this market. 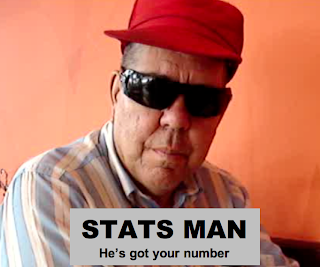 One of my All My Donuts characters, STATS MAN, just got a new position and he may be required to use PowerPoint. Until today, he was as proficient at sky-diving or flying the Space Shuttle as he was at Microsoft's presentation software. Today, STATS MAN learns PowerPoint. Look for presentations to be coming to a school near you because the STATS MAN learned PowerPoint.